Melissa Stevens shows children with cancer how to do arts and crafts in a program conducted through Phoenix Children’s Hospital. What attracted you to GCU? I obtained my Masters of Science in Leadership online and am currently working toward my Doctor of Education on campus, so GCU has been a huge part of my life for years! What do you do for fun and where do you find that outlet? I love traveling. I use my Southwest Airlines reward points to hop on a plane to a random city or plan a trip to Walt Disney World with my family. I enjoy hiking the Arizona mountains or trying out a new coffee shop to work on my doctoral dissertation. What are you passionate about? I am passionate about making a difference in the community. I volunteer a lot! I am a wish granter (project manager) for the Make A Wish Foundation of Arizona. I grant the wishes of children around the Valley who have life-threatening or terminal illnesses. I was sick as a kid, so this is my way of giving back to a community of people I feel close to. I have had some very interesting wish requests! I have granted the wish of a little girl who wanted to ride in a carriage pulled by a pink pony, a teenager who wanted to see the Northern Lights, a kid who wished to go on a shopping spree (he filled a limo full of stuff!) and have even granted the wish of a little boy who wanted to be Spider-Man for the day. What are your favorite places or events in the Valley that you like to visit? I love attending First Friday in Downtown Phoenix! There are some very “unique” people here, and First Friday has some great people watching. 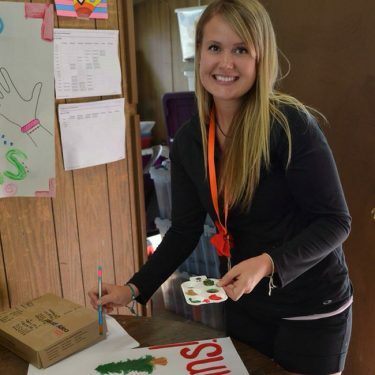 Tell us something about yourself that most people don’t know: I lead arts and crafts at a camp for children with cancer through Phoenix Children’s Hospital. For one week every August, pediatric oncology patients get to leave their hospital room and head to Prescott to rock climb, horseback ride, sleep in cabins and just be KIDS for once! For me, it is the most humbling week of the year, and I love serving these kids who deserve to have fun during a very difficult time. What are you most proud of? I am most proud of creating a life I love by serving others. I am able to use my passion for event planning and project management to create unique experiences for sick kids and bring hope to their families. I am so glad to work for GCU, which supports my passion by providing volunteer days! 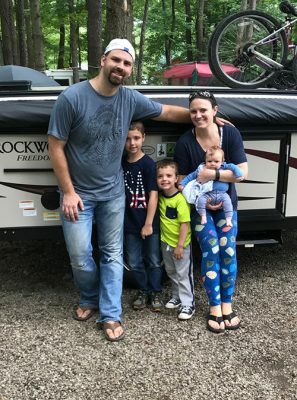 Russell Graham and his family on one of their outdoors outings. What attracted you to GCU? Inspiring people through education. What do you do for fun and where do you find that outlet? I am an active outdoors enthusiast. I love to hike, camp, fish, hunt and be outdoors sharing those experiences with my wife and three sons. I grew up loving the outdoors from a very early age. My dad and I would always go fishing, hiking and hunting, and it was a different experience every time you go out. You learn so much from being outdoors, and the best part of it is you get to enjoy beautiful scenery — it brings a peacefulness to me. Now I get to share those same experiences and times with my three sons and wife. They all love the outdoors and can’t wait until it is camping season every year. I enjoy every minute of it. What are you passionate about? Inspiring others to further themselves in their lifelong goals. What are your favorite places or events in the Valley that you like to visit? I haven’t gotten to visit much, but I really want to go to Camelback Mountain. Tell us something about yourself that most people don’t know: I have been skydiving, and it was one of the best experiences of my life. I love everything that involves adrenaline, and skydiving sure does. There is no experience quite like that rush when you are standing on the edge of the door of the plane to jump out from 10,000 feet and falling through the open sky at 120 mph. It is the most exhilarating experience, and when you finally touch down on the ground you’ll never forget it. What are you most proud of? My family. We try every day to instill the right attitude and respectfulness toward others and really enjoying each and every day to the fullest.